Traditional, corporate publishing houses select a handful of books, market them and sell them. This commercial model ticks all of the boxes required to sustain the arguably writer-celebrity led business model which drives high street retail. Creativity is not necessarily rewarded as much as marketability. For readers, this can make a visit to high-street stores a rather dry experience featuring stacks of genre staples, familiar authors, seasonal sellers and special offers. Self-publishing works the other way round. Creative, niche and unusual books are published and it is readers and writers who review and evaluate the quality and worth of each title. That quality is increasing and over half of Amazon’s daily best-sellers are now self-published books. Browsing online for books offers a diversity of authors and genres that high street retailers, which are powered by the larger commercial publishing houses, can only dream of. Self-published authors who care about their titles are authoring books which are professional, creative and original. They look like beautiful, traditionally published books but they do not necessarily conform to any commercially aware standards, and instead provide the innovation, originality and risk which readers crave. Self-published authors are turning into true, independent publishing houses with solid readerships and multiple titles, redefining what literary publishing culture actually is. So where does this leave traditional publishing houses? Scouring the online retailers for the newest, hottest self-published writers. The creative heart of literary culture no longer beats in the lofty halls of big establishments, but in the studios, back rooms, bedrooms, cafes and cupboards of the thousands of virtuoso writers who are changing the face of the publishing industry, daily. 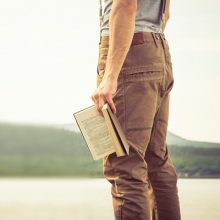 Self-publishers are taking risks, writing well, producing professionally presented titles and showing traditional publishers exactly how to reinvigorate readers.